It is made with triple infusion of Ayurvedic freshly ground Bhringra plant to enhance hair growth. For pronounced hair volume. Combined with organic freshly pressed hair regeneration oils. Made with indigenous sources of oil and combined with the soothing list of Mexican Aloe Vera. All plant ingredients, 100% suitable for vegans. For the entire treatment, use a HERBAL SHAMPOO FOR GROWTH. 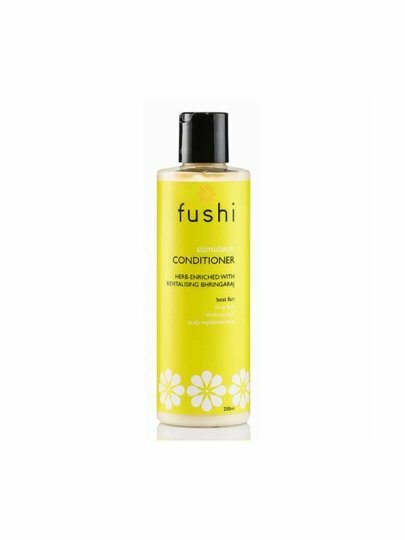 Fushi hair care products are without parabens, various chemicals and artificial perfumes. Aqua (water) W, Cetearyl alcohol (from coconut oil), Behenamidoproply dimethylamine (from rapeseed oil), Argania spinosa kernel oil, Eclipta prostrata leaf extractF (bhringraj), Sapindus mukurossi fruit extractF (aritha) Adamonia typata seed oil + (fushi organic baobab oil), Simmondsia chinensis seed oil + (fushi organic golden jojoba oil), Prunus amygdalus dulcis seed oil + (fushi organic golden sweet almond oil), Cocos nucifera oil + (fusia virgin sri lankan coconut oil), Hydroxypropyltrimonium honey (from natural honey), Butyrospermum parkii butter + (fushi organic ghanaian shea butter), Panthenol (vitamin b5 derived from honey), Rosmarinus officinalis waterF (rosemary), Laurus nobilis leaf waterF (bay leaf), Caprylic / capric triglyceride + coconut oil), Tocopherol (natural d-alpha-tocopherol from olive oil), Benzyl alcohol (natural organic preservative), Citrus limon peel oil (Citrus lemon oil), Citrus aurantifolia peel oil expre ssedE (fushi lime peel oil), Citrus bergamia peel oil expressedE (fushi bergamot oil), Santalum album wood oilE (indian sandalwood oilfield), Hydrogenated ethylhexyl olivate (from olive oil), Lactic acid (from soy sauce), Glycereth-2 Coconut oil, Sodium benzoate (from fruit salts), Dehydroacetic acid (natural organic preservative), Hydrogenated olive oil (from olive oil), Helianthus annuus seed oil (cold pressed sunflower seed oil), Sorbic acid food preservatives), Hippophae rhamnoides fruit oil (sea buckthorn), Linalol, d-Limonene, Citral, Geraniol. Umash in the scalp throughout the entire length of hair. Rinse and repeat.